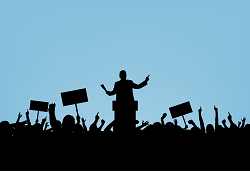 Does your member organization allow candidates to campaign during elections? While many organizations are aware of the benefits candidate “electioneering” can bring to the voting process, they may be intimidated by the responsibilities that come along with allowing for campaigning. Equal treatment of the incumbent and all challengers is vital in election campaigning. The role of your organization is to ensure all candidates have the same opportunity to promote their messages, educate voters and that no candidate has an unfair advantage over others. Your organization will need to set up a formal policy to determine campaigning rules and how they will be enforced. That means your organization will need to track campaigning activity of all candidates. You will also need to ensure the “golden rule” is in place – candidates treat each other with respect and courtesy, and will be treated well by your organization. First determine if your organization has resources to put such a campaigning policy in place, then make sure you have the ability to confirm everyone plays by the rules. The saying goes, “You can’t please all of the people all of the time,” but as a member organization it’s your job to get as close as possible. You don’t want candidates to walk away from the election with a negative opinion of the process, even if they do not win. Set the rules, make sure candidates adhere to them, remain fair and impartial, communicate openly throughout the process and you can make campaigning a positive experience for everyone involved. We’ve held thousands of elections for member organizations across the country over the past 25 years. More and more, we see that when organizations allow candidates to campaign during elections, it encourages voter response. Of course, your organization must weigh the responsibilities and challenges of changing your election’s process, but the benefits may make it worth your while. For more information on how to integrate campaigning into your member organization elections, download our FREE eBook 8 Tips for Successful Campaigning Policies. Do you have tips on other things organizations should consider when allowing for campaigning? Let us know in the comments below.